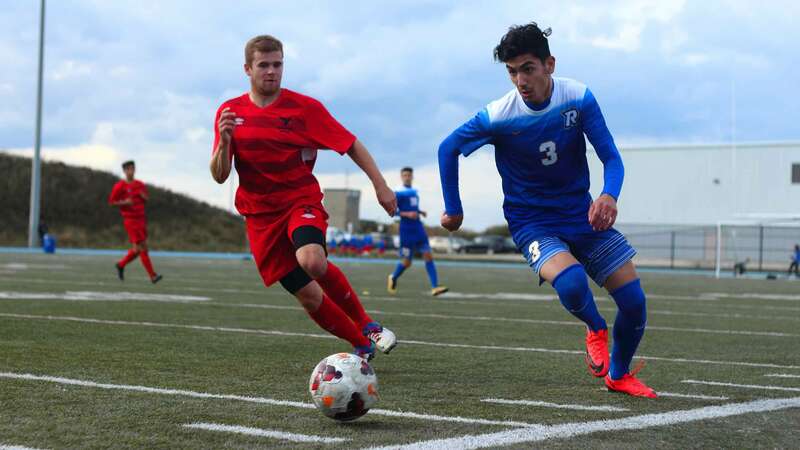 Ryerson’s men’s soccer team settled for a 2-2 draw against the Carleton Ravens in their regular season finale at Downsview Park on Sunday. The Ravens tied the game on a penalty kick in the 88th minute after the Rams were called for a hand-ball in the box. Nick Lambis had both the Ryerson goals. The fourth-year forward put Ryerson ahead 2-1 in the 78th minute, finishing on a well-placed ball from midfielder Misel Klisara. In the first half, Lambis opened the scoring in the ninth minute, finishing a pass from with a tap-in that was nearly stopped by a Ravens defender on its way into the Carleton net. The Ravens tied it 10 minutes later when Julian Piccioli had an open net after Rams keeper Ali Ghazanfari collided hard with a Carleton forward, as the teams took a 1-1 tie to the locker room. Ghazanfari finished with five saves and Ryerson had six shots on net. After clinching first place in the Ontario University Athletics (OUA) East and a first-round playoff bye with a win over Nipissing on Oct. 15, the Rams sat several starters for rest and accumulated yellow cards. Keeper Praveen Ahilan, defenders Robert Boskovic and Kyle Stewart, and forwards Raheem Rose and Jamie Baker all did not play for Ryerson on Sunday. Each had two yellow cards and would have missed their first playoff game if they earned another against Carleton. In women’s action, the Rams lost a close 1-0 decision to Carleton in their last game of the year. Brittney Clendenan had a strong performance with five saves on six shots, but the Ravens scored in stoppage time to send Ryerson home with the loss. The women’s team finishes with a 5-10-1 record to sit eighth in the OUA East division and outside the OUA playoffs. NOTES: Men’s players Luka Lee and Jamie Baker and women’s player Nicole Paiva were all honoured in pre-game ceremonies before playing their last regular-season games for Ryerson. UP NEXT: The men’s team plays its first OUA playoff game on Sunday, Oct. 30. Kickoff is set for 6 pm at Downsview Park. The Rams will play the lowest-seeded winner of Wednesday’s first-round OUA East playoff games [(3)Carleton vs. (6)Trent and(4)Queen’s vs. (5)Laurentian].